Wow, it has been three years now since the first release of SnipNotes on the App Store. Most apps don’t survive that long, so I’m incredibly happy that SnipNotes is still around and getting better every year. Last year saw the release of SnipNotes for macOS. I learned a lot since then. Developing for and maintaining multiple platforms is a much bigger challenge than working on an iOS app alone. But I’m committed to moving the product forward on all platforms and plan to introduce some major and long requested features this year. Thank you for sticking with SnipNotes! A big new update will be available shortly. This entry was posted in General on 02/26/2018 by SnipNotes. I'm happy to report that two new updates have just been released on the App Store. SnipNotes 1.1 for macOS is the first major update since the initial release in late June. This new version adds a few features that didn't make it into the initial release like printing, the ability to export multiple notes and support for the SnipNotes URL scheme. SnipNotes 2.5 for iOS contains many internal improvements like automatic saving and adds several user requested features. You can now protect individual categories with a passcode or Touch ID, control which view is shown on startup and export notes as text files to various cloud services and other apps. You can learn more about both updates in this blog post. If you have any questions or suggestions, please feel free to leave a comment below or get in touch with me directly. This entry was posted in General on 09/01/2017 by SnipNotes. A major milestone has been achieved with the release of SnipNotes for macOS. Since then I’ve been working to enhance many aspects of the app and make stability improvements. Today I want to share my progress so far and what you can expect in the next updates for both iOS and macOS. You can try out these features today by signing up for the beta test. This entry was posted in General on 08/08/2017 by SnipNotes. 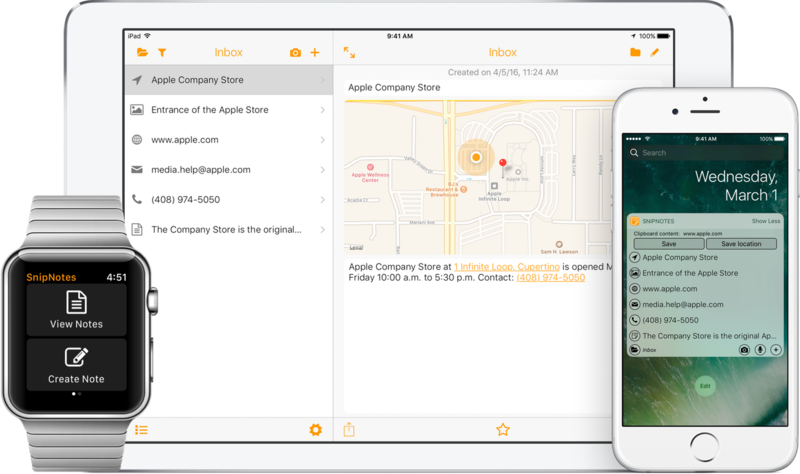 SnipNotes for macOS, SnipNotes 2.4 for iOS and more! Today marks the final release of SnipNotes for macOS! Thanks to all the beta tester, who provided invaluable feedback over the course of the last several months and made this release possible in the first place. 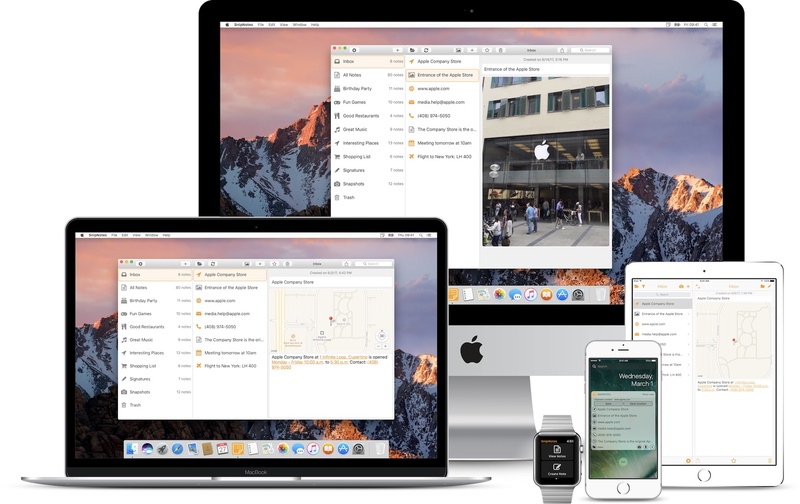 SnipNotes for macOS brings many of the features you know and value from your iOS devices to the Mac. 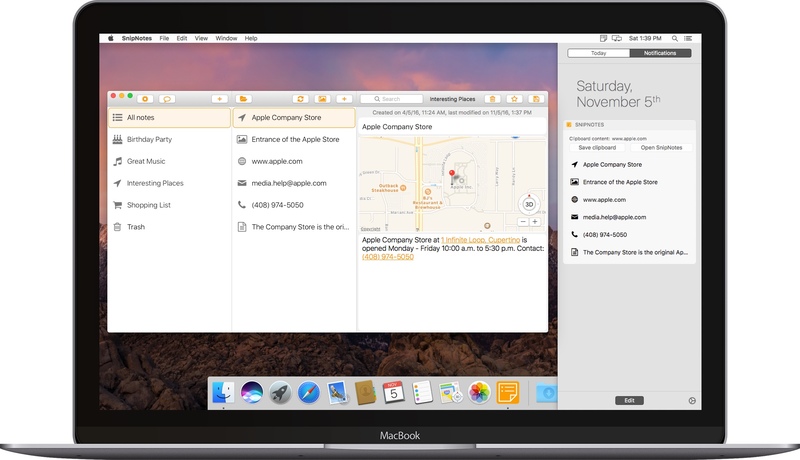 While the look and feel of the new app is very familiar, it is packed with a lot of features unique to the Mac. For example, you can quickly create new notes right from the menu bar and with keyboard shortcuts. The app offers drag-and-drop support, multiple note selection, automatic saving and more. Both apps are available with a discount for a limited time! Here on the homepage you will find detailed information on both apps. I've created a new comprehensive overview about all the features SnipNotes has to offer on each platform. There is also a brand new help section, which will be expanded continuously and can also be accessed from within the app. If you have any questions or feedback, please don't hesitate to get in touch with me. You can also reach out on Twitter. This entry was posted in General on 06/22/2017 by SnipNotes. After almost three months of development and six beta releases, SnipNotes 2.3 is finally available on the App Store as of today! This update is quite huge, it contains several new features, many improvements as well as bug fixes. Let's take a look. This entry was posted in General on 03/09/2017 by SnipNotes. 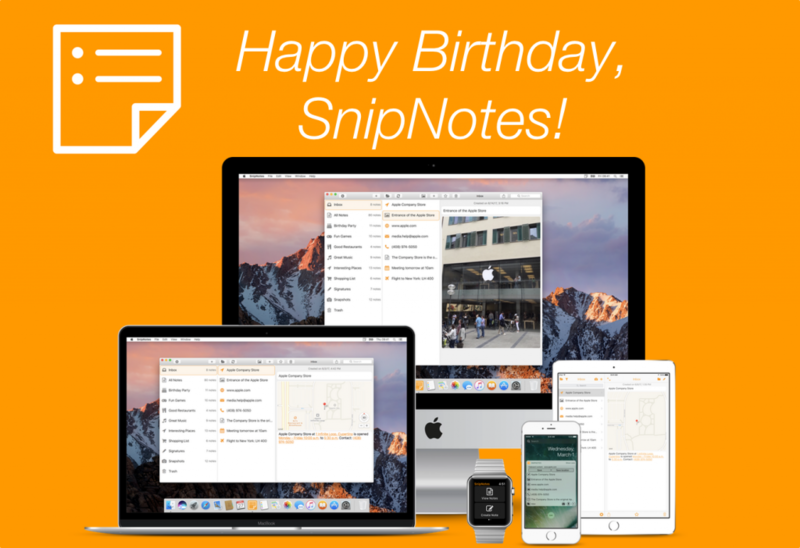 Today is SnipNotes’ second birthday! 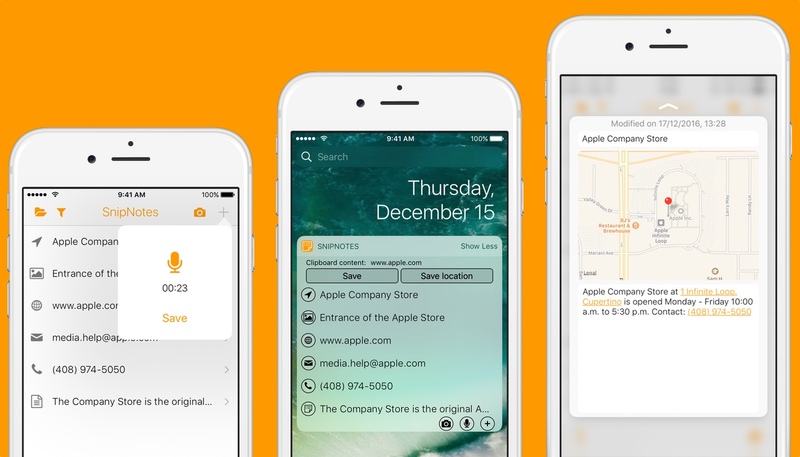 Two years ago SnipNotes was released on the App Store. Happy birthday! Thank you very much for your support and your constructive feedback. To an exciting new year! This entry was posted in General on 02/26/2017 by SnipNotes. A new major update is currently in development which improves and simplifies the usage of categories. Let's take a look. This entry was posted in General on 01/31/2017 by SnipNotes. 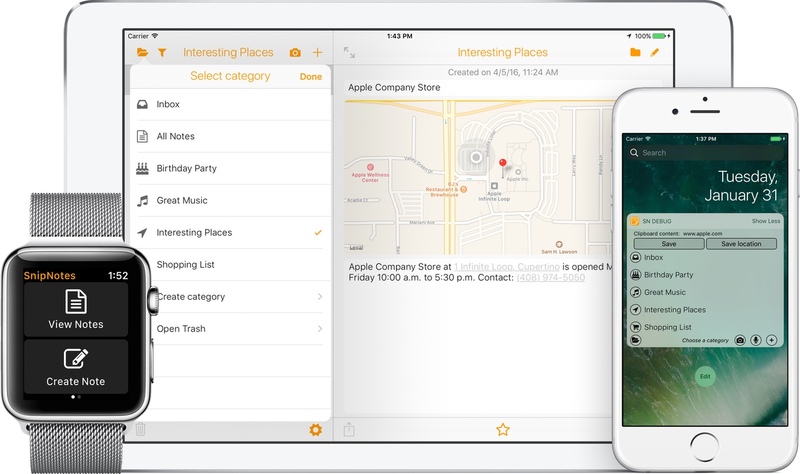 SnipNotes 2.2 has arrived on the App Store today! This update takes full advantage of 3D Touch, gives you more ways to create notes and optimizes the app for iOS 10. For a limited time, SnipNotes is available for just 99 cents! This entry was posted in General on 12/21/2016 by SnipNotes. Development of the Mac app is making good progress, the third beta is now available. That's a good moment to give you an overview of what's new since the first beta. This entry was posted in General on 11/05/2016 by SnipNotes. SnipNotes for macOS is now available for beta testing! You have requested it, now you can take a look for yourself: I'm happy to announce the first SnipNotes beta for macOS! Development is far from finished, but I want to incorporate your feedback as early as possible. This is a completely new app after all. You can download the beta right below, there is no registration required. Read on to learn what's inside the first version and what's still missing. This entry was posted in General on 10/07/2016 by SnipNotes.